You’re probably thinking TSR has a lot to offer and is a convenient place to upload all your sims-related stuff without having to worry about hosting costs. So why did I leave? Okay, I was asking for it, but I find it quite ironic that posting an e-mail from EA, the very publisher without which TSR would not exist in the first place, warranted my account being locked. And even more ironic (or should that be moronic), even though I’m evil enough for them to lock my account, they were still quite happy to keep my uploads and stories on their site, even after being requested to remove them. Why? You know, I couldn’t care less about being banned – I posted up the message from EA having already decided to no longer submit anything to that site – but why is it that to this day they still haven’t given the reason for the banning? Thomas, why don’t you grow a pair and just say outright you banned me for dissenting? And why did it take torrenting their pay content for my work to be finally removed? Not only that, they send spies into filesharing sites, like the Pirate forum and SimsFileVault, and check the usernames, profiles, even avatars and signatures of forum members and compare these to TSR members. If they find any of them match up, your TSR account gets locked pronto. This is how I got caught. My username on the pirate forum was different from my TSR name. But stupid me didn’t black out my name in the screenshot. Doi. The spy found me and I was blocked in under an hour. Sneaky. Just shows how much contempt TSR has for its own members. Even if you have taken out a subscription that very day – if you get caught filesharing, you can forget about their refunding you. Legally, Electronic Arts owns the rights to all material created from our engine, and that the sharing of said material for free on community sites is completely legal, even if it is material that some players are attempting to sell. You’re not paying to use the stuff (CC), you’re paying to keep the site open. Websites are not free, there’s money involved. Most sites call them “donations” and that’s exactly what it is. You’re donating money to help keep the website open. TSR is the ONLY website I have ever paid for, and that’s because there’s so much here. At any time of the day, you’ve got great people who can help you fix errors, there’s so many downloads, and so much more troubleshooting and help areas. It’s a GREAT site, and that’s why I chose to “suscribe” (sic). In other words, if you want these files now, you will have to pay for them. This is a sale, no matter what name TSR and its sheep wish to give it. If you donate £50 to Oxfam, you will not expect them to provide your lunch for the next 6 weeks. Likewise, if you donate to a fansite, you should not expect anything more than an e-mail of thanks. If you receive something for donating, it stops being a donation and starts being a sale, and a sale is a sale; call it what you like, it doesn’t change the nature of it. You may include materials created with the Tools & Materials on your personal noncommercial website for the noncommercial benefit of the fan community for EA’s products, provided this is beneficial to the product(s) in EA’s judgment, and provided that if you do so, you must also post the following notice on your site on the same web page(s) where those materials are located: “This site is not endorsed by or affiliated with Electronic Arts, or its licensors. Trademarks are the property of their respective owners. Game content and materials copyright Electronic Arts Inc. and its licensors. All Rights Reserved.” You will not represent that your site is endorsed or approved by or affiliated with EA or our licensors or that any other content on your site is endorsed or approved by or affiliated with EA or our licensors. 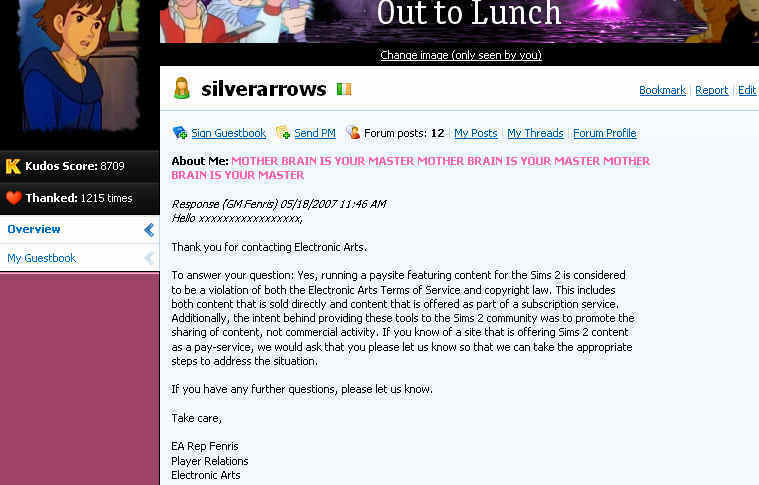 The fact that TSR censors any mention of this on the site (despite that everyone who has installed The Sims 2 will have seen this anyway) would lead one to believe that TSR KNOW they are in the wrong by charging for content. Lastly, hundreds of members upload free content to TSR in the spirit of sharing (more here), and TSR is very unfairly making money out of this. Applications like SimPe were made for the benefit of the Sims community, not so that certain websites can use it to make a profit. If you need more convincing, visit The True Face of TSR and Associated Content’s paysite article… and don’t forget to raid the booty!! !